Tanya Grimsley is the daughter of a retired U.S. Navy Chief, born in Yokosuku, Japan and raised all over the United States. In 1983, Tanya and her family left the California coast and moved to her fathers state of birth. Marietta, Georgia. 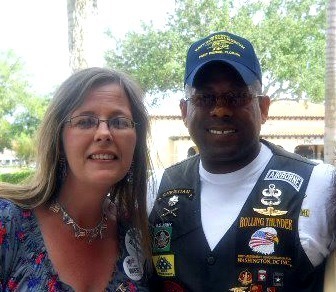 She began her endeavor into politics after watching a little known rising superstar speak at a conservative rally in Florida, Allen West. The rest is history. Great American Republic is owned and operated by Tanya Grimsley since 2009 along with other various social networking applications and sites. She is a self-taught social media editor and manager. Tanya is also the blogger that helped launch Colonel Allen West into the spotlight in 2009. Her efforts with the grassroots patriots of this nation help raise awarness for the Colonel and in turn yielded him enormous financial support for his elections. Tanya gave the Colonel a platform, until he had a website and Facebook page of his own by spreading his message across all her social media platforms. Her ability to gather a strong patriot army everywhere to champion Colonel West’s campaigns and causes. Tanya and her father Paul provide thought-provoking commentary and offer opinions and insight on national, local and world news stories. We offer a short blurb of our own creation and give a highlight from the news story, then direct the traffic to the actual news agency. The news we choose to report on is generally top stories and trending topics. Great American Republic is a for-profit, news curator. We generate revenue for our mission through advertising. While our job is to report only truthful news stories, we will occasionally make mistakes. When we do, we commit to hastily correcting our errors so that our readers can get the real story. If you spot an error, please alert us. The prominence of our correction will be commensurate with the gravity of the error. Typos will be corrected without fanfare, minor corrections will be noted at the bottom of the article and major factual corrections will be noted at the top. Tanya is a Pro-Life, Second Amendment supporting Christian who supports President Donald Trump. She does not believe in the Russian Collusion and she does not believe in man-made global warming. All images are obtained through Wiki Commons Public domain and YouTube screengrabs. Editor in Chief, Tanya Grimsley. (Wife, Mother, Daughter, lover of news) self-taught, social media expert. Op-Ed Commentator/Writer: Paul Clark (ret, U.S. Navy Chief) Dad to Tanya, lover of news, snarky, witty and a beloved veteran. As we are news curators and not creators of the original news stories, all contact can be made to us through the contact us section of the website.